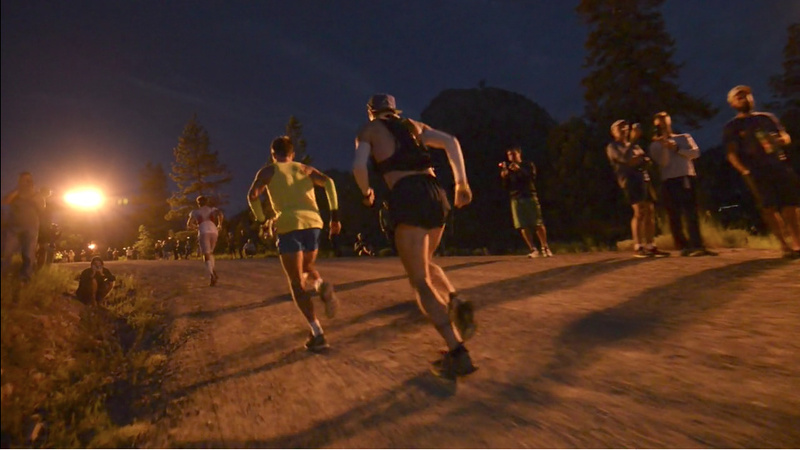 Racers start off in the darkness at the Western States 100-Mile Endurance Run. On Saturday at five a.m., the starting gun will go off at a race in Northern California. It's the oldest, most prestigious long-distance foot race in California. But it's not really well known, even though it's been around for decades. It's not a cute little 10k or even a marathon. It's called the Western States 100-Mile Endurance Run—as in ONE HUNDRED MILES. Starting at the Squaw Valley ski resort, east of Fresno, it winds through the trails of the Sierra Nevada mountains. Elite runners go up and down through mountains more than ten thousand feet high. The winner usually crosses the finish line a hundred miles away in more or less fifteen hours. "To prepare, I logged over 100 miles a week for a few months, including a lot of long runs in the mountains. I also trained my body to adapt to the heat by running in the middle of the day with lots of layers and by putting the heat on in my car at full blast. I acclimatized myself to high altitude, but camping close to 8,000 feet above sea level. Conditions on the course will vary from several inches of snow to temperatures over 110 degrees Fahrenheit. So, there are a lot of variables I'll have to consider. But the number one thing that will be on my mind, when I tow the line, will be making it to the finish line at Placer High school. As quickly as possible and ahead of as many people as possible." Like a lot of the almost 400 people who compete in the race, Joel isn't a well-known athlete. And there's no prize money for the trail race. For the most part, people run the Western States simply for the love of running, a long...long way. And yet, for the first time in its 44 year history, runners will be tested for performance-enhancing drugs. For more about the race and why they decided to start testing for performance-enhancing drugs now, A Martinez spoke with John Medinger. He's the President of the Board of the Western States 100 and has run over 150 ultra-marathons himself. Can stray animals be saved by this 14-foot tall robo-dog?